By now, we’ve all seen the history-making snapshot of the supermassive black hole at the centre of galaxy M87 staring back at us like the flaming eye of a vengeful god. It’s a powerful image. Makes you feel tiny. Really tiny. Not feeling it? Maybe you just need to comprehend the scale of this thing. This beast is roughly 55 million light years away, deep inside a galaxy with a radius of 60,000 light-years. Our own galaxy is over 100,000 light-years across by comparison. 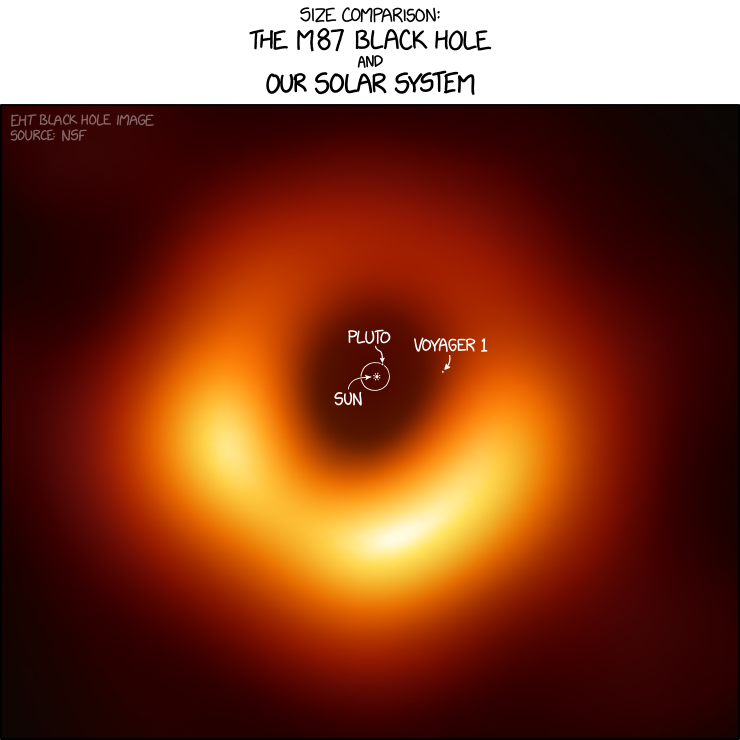 The black hole’s mass is something else. Multiply the amount of stuff that makes up our Sun by 6.5 billion. Cram all of that mass into a volume so small, it technically has no spatial dimensions. This odd little dot packed with a stupid amount of mass warps surrounding space to such a degree, even light lacks the acceleration to compete with it. To have a hope of escaping, that photon would need to be around 18,000,000,000 kilometres away from the middle. Or about 122 times the distance between Earth and the Sun. Any closer, and it falls into its warped shadow of doom. Outside of that border of no hope, matter swirls ever closer to oblivion at a rate that approaches the Universe’s top speed limit, spewing out radiation as it goes. Sometimes numbers just don’t do it justice. A scale diagram is what you need. Lucikly Randall Munroe of XKCD fame has provided just that. Just look at it and weep. (Randall Munroe/XKCD) Thanks, Randall! Now we feel even smaller.